“The Governing Council expects the key interest rates to remain at present or lower levels for an extended period of time.” With this pronouncement on 4 July 2013 at the press conference following the monthly meeting of the European Central Bank Board of Governors, Mario Draghi initiated the adoption by the ECB of a new communication strategy called “forward guidance”. Since then these words have always been included in his speech following announcements of the ECB’s monetary policy, and he has repeated them again today . What should we expect? Forward guidance has recently been adopted by several central banks, but the methods chosen by the ECB differ and indicate that this measure will have only limited effectiveness in the euro zone. Communication has become an integral part of the conduct of monetary policy since interest rates have been kept at a minimum level. More specifically, forward guidance consists of announcing and making a commitment to the future path of key interest rates. By doing this, the central banks want to increase the transparency of their activities and anchor expectations. The aim is to clarify both their strategy and their predictions about trends in the economy. In the present case, the central banks want to affirm their desire not to raise interest rates in the near future. They also hope to influence private expectations about short-term rates, and thus long-term rates, in order to strengthen the transmission of monetary policy, and thus support the economy. The promoters of the forward guidance strategy, foremost among them Eggertsson and Woodford (2003), suggest that monetary policy can be made more effective by adopting a policy of stable interest rates that is well known in advance. This proposal is justified by the fact that demand for credit is highly dependent on expectations of long-term interest rates, which depend on expectations of short-term rates. Hence, by announcing the future levels of interest rates in advance, the central bank declares its intentions and dispels any uncertainty about its future decisions. This strategy is especially relevant in a situation of a liquidity trap, when nominal interest rates are close to zero, as is the case today. The traditional tool of central banks is then constraint, as nominal interest rates cannot be negative. Central banks can thus no longer influence the cost of the loans granted, but they can on the other hand influence volumes through unconventional measures . The channel of expectations and the transmission of signals to private agents then become paramount and complement quantitative easing. It is important to note that the effect of forward guidance on long-term rates and thus on the economy passes through the term structure of the interest rates. Several theories attempt to explain how rates vary in accordance with the term. The term structure of interest rates can be considered from the viewpoint of the theory of expectations, which assumes that long-term rates reflect a combination of expected future short-term rates, and thus that the different maturities are perfect substitutes. For its part, the theory of a liquidity premium implies that long-term interest rates include a premium linked to the existence of one or more long-term risks. Finally, another theory is based on the assumption of market segmentation and stipulates that financial instruments with different maturities cannot easily be substituted and that their prices move independently. If investors wish to hold liquid assets, they will prefer short-term instruments over long-term ones, and their prices will vary in opposite directions. Only in the case of the first two theories will forward guidance have the desired effect on long-term rates. This kind of strategy had already been implemented by some central banks even before the 2008 financial crisis, in particular in New Zealand since 1997, in Norway since 2005, and in Sweden since 2007. The United States also implemented this communication strategy several times when rates were very low. The Federal Open Market Committee (FOMC) implicitly introduced forward guidance in its communications in August 2003. At a time when its target rate was at a historic low, the FOMC stated that “…policy accommodation can be maintained for a considerable period”. This terminology, specific to forward guidance, remained in FOMC communiqués until the end of 2005. It reappeared in December 2008, and in greater detail in August 2011, when Ben Bernanke, chairman of the US Federal Reserve (or the “Fed”), announced that economic conditions warranted maintaining the federal funds rate at a low level until at least mid-2013. Since then, the announcement on 13 September 2012 that the Fed will not raise its rates before mid-2015 continues this same strategy. To understand what impact the ECB’s forward guidance might have, it is important to distinguish two types of forward guidance: one for which the action of the central bank is subject to a time period, and another which depends on economic variables, including thresholds that trigger an action on the bank’s part. In the case of the Fed, the first statements mentioned above refer to a period of time, but since December 2012 it has conditioned its commitment to future rate changes on cyclical thresholds that act as triggers. The Fed has also announced that “this exceptionally low range for the Fed Funds rate will be appropriate at least as long as the unemployment rate remains above 6-1/2 percent, inflation between one and two years ahead is projected to be no more than a half percentage point above the Committee’s 2 percent longer-run goal, and longer-term inflation expectations continue to be well anchored”. The arrival of new FOMC members in January 2014 could, however, change the timing of the next monetary tightening. Likewise, in August 2013 Mark Carney, Governor of the Bank of England (BoE), set out a forward guidance strategy indicating his intention not to raise rates so long as the unemployment rate had not fallen below 7%. This commitment is nevertheless conditional on containing inflation, on stable inflation expectations and on the neutral impact of this commitment on financial stability. There is a major disadvantage to conditioning forward guidance on a time period, as has been adopted by the ECB (and as will be described later): changes in economic conditions over the time period in question could render the commitment obsolete. The announcement thus has very little credibility. Conditioning forward guidance on thresholds for economic variables does not have this drawback. One criterion for the credibility of commitments conditioned on thresholds is, however, that the underlying variables chosen are observable (GDP rather than output gap) and that they do not suffer from measurement errors (inflation rather than inflation expectations), so that private agents can assess whether the central bank is acting in accordance with its commitments. Then and only then will the agents have confidence in the declarations and will the central bank be in a position to influence expectations of long-term rates. The relative advantages and disadvantages of the two types of forward guidance explain why the Fed switched from one to the other and why the BoE has also made ​​a commitment linked to thresholds. The establishment of forward guidance conditioned on a threshold for a macroeconomic variable may, however, contribute to muddying the waters on the ranking of the central bank’s objectives. If several variables are targeted simultaneously and they begin to diverge, what will the bank decide? The Fed does not prioritize its objectives. As the economy emerges from crisis it is quite possible that the Fed may decide to ensure the strength of GDP, or to lower unemployment rather than inflation. For its part, the BoE follows a strategy of inflation targeting. It has therefore defined conditions (“knockouts”) on inflation, inflation expectations and financial stability, which, when they are not met, will lead to an end to forward guidance and therefore to any commitment to keep rates unchanged. The hierarchy of objectives would thus be well respected and the BoE’s credibility maintained. How effective can forward guidance be? Kool and Thornton (2012) express serious doubts as to the results obtained through forward guidance. They assess the predictability of short-term and long-term rates in countries where this strategy has been adopted and show that forward guidance improves the ability of private agents to forecast future short-term rates only for periods of under one year, without improving the predictability of rates in the longer term. 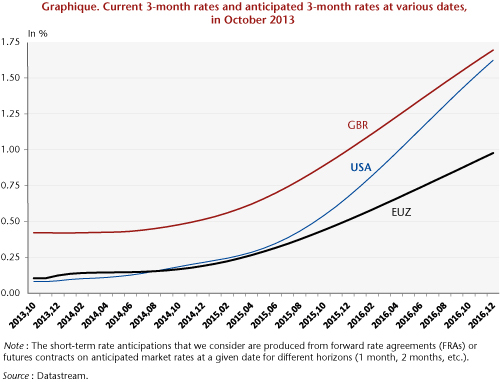 The chart below shows the expectations of 3-month rates by the financial markets in October 2013 for the coming months. Since benchmark rates change by a minimum of 0.25%, this figure indicates that no change in rates is expected for the time being, apart perhaps from the United States for the one-year horizon. With regard to the ECB, which for its part sets a hierarchy of goals by giving priority to inflation, the introduction of forward guidance constitutes a conditional commitment to a period of time (“… for an extended period of time”) without any reference to thresholds. From this point of view, it goes against the current of the Fed and the BoE, which adopted conditional commitments to numerical thresholds. For the record, prior to July 4th the ECB gave clues to its decision in the following month in the form of expressions that were easily recognizable to observers. Thus, the insertion of the word “vigilance” in the ECB President’s speech at his press conference announced a probable tightening of monetary policy . By adding forward guidance to its basket of tools, the ECB wants to be less enigmatic. In particular, it seems that it wanted to respond to concerns over a possible rise in interest rates. However, Benoit Coeuré, a member of the ECB Executive Board, said that this strategy does not call into question the rule, repeated many times at press conferences, that the ECB will never commit to future policies (“no pre-commitment rule”) and that forward guidance is to be re-evaluated at each meeting of the Board of Governors. Jens Weidmann, a member of the ECB’s monetary policy committee as president of the Bundesbank, confirmed that the ECB’s forward guidance “is not an absolute advanced commitment of the interest rate path”, while Vitor Constancio, ECB Vice-President, added an extra dose of confusion by saying that the ECB’s forward guidance “is in line with our policy framework as it does not refer to any date or period of time but is instead totally conditional on developments in inflation prospects, in the economy and in money and credit aggregates – the pillars of our monetary strategy”. So how effective can a policy be that is poorly defined, that does not seem to have a consensus within the ECB Governing Council, and whose key to success – the credibility of the commitment – is openly questioned? Not very effective. Eggertsson, G. and M. Woodford (2003). “Optimal monetary policy in a liquidity trap”, NBER Working Paper (9968). Kool, C. and D. Thornton (2012). “How Effective is Central Forward Guidance?”, Federal Reserve Bank of Saint Louis Working Paper Series. Rosa, C. and G. Verga (2007). “On the Consistency and Effectiveness of Central Bank Communication: Evidence from the ECB”, European Journal of Political Economy, 23, 146-175. * This text draws on a study, “Politique monétaire: est-ce le début de la fin?” [“Monetary policy: Is it the beginning of the end?”], forthcoming in The OFCE outlook for the global economy in 2013-2014 [in French]. Today’s 25-basis point cut in the benchmark rate is consistent with the ECB’s strategy of forward guidance. Unconventional measures refer to monetary policy practices that are not classified as traditional policy (i.e. changes in interest rates). These are measures that result in a change in the content or magnitude of the central bank balance sheet through purchases of government or private securities, which is generally referred to as “quantitative easing”. Rosa and Verga (2007) offer a description of these expressions.